No, Morgan, Ben likes when I wear short shorts. Rugby is a really great game. Especially Union Rugby, and especially when it’s some of the world’s best teams competing against one another. 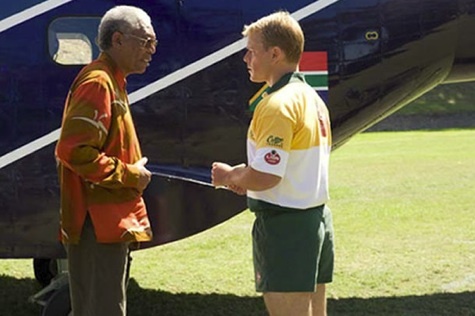 Such is the scene for Clint Eastwood’s latest film, “Invictus” which centers around the 1995 Rugby World Cup, which was hosted by South Africa, fresh off the 1994 election of Nelson Mandela as President following his release from prison in 1990 (1991 to 1993 not so interesting). The film is meant to show how Mandela’s support of the national team, long seen as a symbol of the oppressive Apartheid system, was a bridge to creating a greater sense of unity in South Africa – and how the team’s success helped to build that bridge. Unfortunately, rather than be a film about a country healing old wounds with the help of sports, we get a sports films that happens to coincide with the country facing up to generations of prejudice. I’ll begin with the good notes. Rugby is fun to watch and there’s a lot of it here. Nearly all of the film’s closing scenes center on a climactic match and it was very much like watching the game on TV – only with rather annoying and repetitive cut aways to three or four groups of people cheering the action along. One very easy indicator of whether this is a film for you or not is your tolerance of sports. If you think you’d be bored by scene after scene after scene of rugby, this is definitely not the movie for you. And before you think your love of the game is enough, you may want to read the rest of the review. Morgan Freeman and Matt Damon are good actors. However, in this film you’re largely basing that notion on previous work rather than anything they do here. We’ve all seen Freeman portray historically significant and powerful people before and you’re not getting anything new here. Also, because Eastwood wanted to focus on how the rugby matches brought the country together, so much of the personal elements about Mandela are casually brushed aside or barely mentioned. Damon gets even less to work with and it’s almost a wonder they bothered to cast a big name at all, seeing as there wasn’t really anything for him to do in the film besides utter a few sentences here and there. Of course, not giving Damon too many lines was also a positive thing, making it more difficult to realize that he didn’t completely grasp the South African accent. Freeman also didn’t sound very believable but I’ve seen anough really bad accent work to just let it go, especially because the rest of the film wasn’t doing anything to make me care enough about this faux pas. The music is another failing of the film. While the overall score didn’t bother me too much (not that I’d give it high marks either), there are some original songs that are completely in contrast with the rest of the film and only serve to break whatever connection you might have built to that point. This is particularly true of the song “Colorblind” which crashes into the film at one point and might as well have included lyrics like “Nominate me for an award please / Can’t you see I’m on my knees?”. I really hate knocking a Clint Eastwood film like this, as I’m a fan of much of his previous work. Sadly though, between “Gran Torino” and now this, it appears he’s in a film making slump which I hope he can rebound from with next year’s “Hereafter”. The more and more I think about it, the worse “Invictus” gets in my mind but I’ll stick a 2 out of 5 rating because of how much I love rugby. Take that for what you will but feel free to skip this film and get to one of the many others coming out this month which are far surer bets. You and I share a lot of the same opinion about this movie – especially the Matt Damon aspect. Man, he really didn’t do anything in this film. They should have just said “starring Matt Damon’s name”.